Last summer, I made a blueberry galette. It was the first one I had ever made and it was so easy and received such great reviews that I couldn’t wait for the next opportunity to make another. Of course, I would remember how I made it. Of course, I wouldn’t need to take any notes. Of course, I would remember what adjustments I made. Of course, I slept and forgot it all. 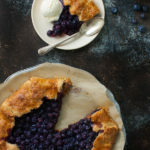 So, last week when my husband came home with 2 pounds of fresh local blueberries from the farmer’s market, I was kicking myself for not jotting down some notes, any notes about that blueberry galette. You would think that after writing a food blog for 2 years that I would be in the habit of always taking notes while I cook but no. Fortunately, I did at least remember where I started with that recipe. Then, it was a matter of having to re-trace the same thought process I would have gone through a year ago in order to try to recall what kind of adjustments I would have made. It was an interesting exercise. Did I use lemon zest or lemon juice or both? Probably both, since I think blueberry and lemon flavors go so well together. Would I have used flour or cornstarch as a thickener? All the blueberry pie/tart/galette recipes I looked at seemed to be evenly divided between the two. I went with cornstarch since that has always worked well for me as a thickener in fruit pies. Who know’s whether I ended up with the same recipe as I did last year but I do know I ended up with another really good blueberry galette. And this time, I took notes. P.S. Don’t forget the ice-cream. This tart isn’t super sweet which means it pairs perfectly with a scoop of vanilla ice-cream. Whisk together the flour, sugar, and salt in the bowl of a stand mixer fitted with a paddle attachment. Cut the butter into 1/2-inch cubes and add them to the flour mixture. On low speed, mix the butter and flour together until the mixture begins to look crumbly and holds together when you squeeze a handful of dough with your fingers, 1 to 2 minutes. If there are still lumps of butter larger than the size of peas, break them up with your fingers. Scrape the bottom and sides of the bowl with a spatula to loosen any flour or butter stuck to the bowl. In a small bowl, mix the egg yolk and milk until well blended and then add them to the flour mixture. On low speed, mix until the dough just comes together, about 15 seconds. Gather the dough into a ball and put it onto a sheet of plastic wrap. Press the dough into a flat disk, wrap it in the plastic, and chill it in the refrigerator for 20-30 minutes before rolling it out. Heat the oven to 400 degrees. Line a rimmed baking sheet with parchment paper. Remove the dough from the refrigerator; if the dough is very firm, let it sit at room temperature until it’s pliable enough to roll without cracking, 10 to 15 minutes. Roll out dough into a 13-inch round on a generously floured surface. Transfer the dough round to the prepared baking sheet and chill it in the refrigerator while preparing the filling. In a large bowl, gently stir the blueberries with the sugar, lemon zest, lemon juice and salt until everything is evenly mixed. Sprinkle the cornstarch over the blueberry mixture and stir until cornstarch is evenly mixed in. Remove the dough from the refrigerator and let it sit at room temperature until the dough is soft enough to fold without cracking, 5-10 minutes. Spoon the filling in the center of the dough round leaving a 2-inch border uncovered around the edge. Fold the edge of the dough up and over the filling all the way around, pleating the dough as you go. Brush the pleated dough evenly with the egg wash. Sprinkle the granulated sugar directly on the dough and fruit. Bake the tart until the filling is bubbling and the crust is golden brown, 35-40 minutes. Transfer to a rack and let cool. Serve slices of warm tart with scoops of vanilla ice-cream. Do you have any suggestions for adapting this recipe for frozen blueberries? I haven’t ever tried frozen blueberries with this recipe but I think it could work. I wouldn’t thaw the blueberries before baking them and I would increase the baking time. If you’re using the grocery store variety of frozen blueberries, I think I would also increase the amount of cornstarch (maybe 2-3 more teaspoons). I find those frozen blueberries have more liquid in them. If the berries were “home frozen” (i.e. frozen in a single layer on a sheet pan and then bagged), I don’t think you would need to increase the cornstarch. I hope that helps. Let me know how it turns out for you.